The scepter and Orb, along with the crown are a symbol of power of the kings, emperors, and kings. Scepter - a kind of symbol of masculinity and power, women. Imperial power is impossible to imagine without its symbolic attributes, such as crown, Orb and scepter. These regalia are common - in addition to the Russian rulers, they were used and used by the kings and emperors of all the world powers. Each of these objects has a special meaning and a unique story appearance. Power (from the ancient word "dyra" - power) is a Golden globe, covered with precious stones and surmounted by a cross (in the age of Christianity), or other symbols. It primarily represents the Supreme power of the monarch over the country. In Russia, this important item came from Poland during the time of false Dmitry I and was used for the first time at the ceremony of his coronation, bearing the name "Apple power". Power is often called an Apple, it resembles the fruit not only for its roundness - the fruit is way of the world. In addition, this deeply symbolic object means feminine. Its round shape power as well as the Apple represents the earth. In the way of power there is a religious dimension as well. Because on some paintings of Christ depicted with her as the Savior of the world or of God the father. Sovereign the Apple is used in the value - the Kingdom of heaven. And after the rite of anointing the Orthodox Tsar transferred the authority of Jesus Christ the king should lead his men in a final battle with the Antichrist and defeat him. According to legend, the sceptre was an attribute of the gods Zeus and Hera (or Jupiter and Juno in Roman mythology). There is evidence that the pharaohs of Ancient Egypt also enjoyed the item similar in value and appearance with a scepter. Shepherd's crook – the prototype of the scepter, which later became familiar to the pastoral power of the Church. European rulers have shortened it, as a result having the subject of medieval paintings and numerous historical notes. 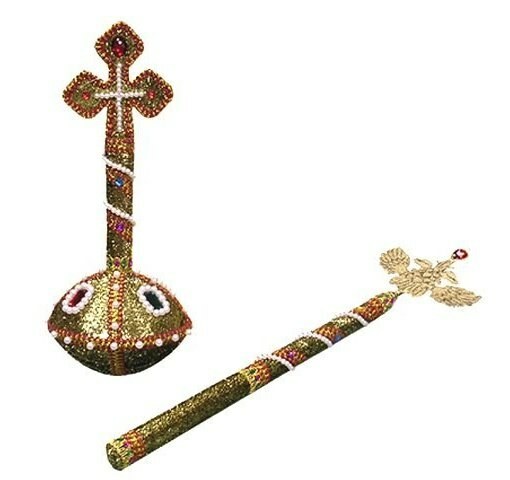 It is shaped like a scepter, made of gold, silver or other precious material symbolizes the male principle. Western European rulers often had a second rod in addition to the main, it acted as a symbol of Supreme justice. The scepter of justice was decorated with "hand of justice" - a finger pointing to deception. At the coronation in 1584 Feodor Ioanovich, the scepter became a sign of autocratic rule. A little less than a century later, his powers began to portray the emblem of Russia.